By 1874, the ox carts began to carry settlers to the areas around the Scratching River (now the Morris River) and the population began to grow. The town of Morris was named after Alexander Morris, the second Lieutenant Governor of Manitoba and was officially incorporated in 1883. 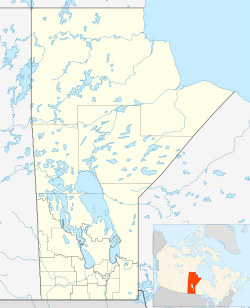 Morris is one of 18 communities in the Red River Valley of Manitoba surrounded by a ring dike. The first ring dike was built to protect the town from the 1966 Red River Flood by the Canadian Army Engineers, the Mennonite Disaster Service and local volunteers. A permanent dike protected Morris during the 1997 Red River Flood. The town of Morris lies in the middle of the Red River Valley. The shallow valley spreads for many kilometers to the east and west, but only rises a few meters at most. The land is remarkably flat. Repeated flooding in the past has left the valley floor covered in rich river silt. The fine black soils are some of the best producing agricultural soils in the world. The Red River Valley is part of the remnants of the prehistoric "Lake Agassiz", which was once much larger than Lake Superior, which is the biggest of the five Great Lakes. Morris had a population of 1,885 in 2016 living in 807 private dwellings on a land area of 6.10 square km with a population density of 309.1 per square kilometer. The median age was 38.8 slightly higher than the provincial average of 38.2. The economy of Morris is based on agriculture. The town of Morris is a major service provider to the surrounding agricultural community. Currently, businesses and manufacturers in Morris produce and supply a variety of goods to both national and international markets. The town of Morris holds a variety of annual events, which brings many visitors to the community each year. Each July, the Valley Agricultural Society hosts the Manitoba Stampede and Exhibition, known as the Big "M". For four days, thousands of spectators and participants from across North America come to watch the competition. The Fair and Exhibition offers something for everyone. One of the largest dairy shows in the province, light and heavy horse shows, school work and home-craft competitions, commercial and craft displays, Loule's famous petting zoo, midway rides, free family entertainment, indoor cabaret Friday and Saturday evening featuring top country bands, community Church service and the popular kids pedal tractorpull on Sunday. The Manitoba Stampede and Exhibition is the largest professional rodeo east of Calgary, Alberta. The Valley Agricultural Society, formed in 1895 was originally established as agriculture fair. This fair was combined with a professional rodeo in 1964 to become an annual event anticipated by many. Morris is located along PTH 75, which is the main route for Manitobans to get into the United States. Morris is also served by PTH 23, running east and west, providing access to much of southern Manitoba. Morris is also served by two railroad companies. The first is the Canadian National Railway whose line runs north/south from Winnipeg to the Canadian/U.S. border. The second is the Canadian Pacific that has a branch which currently ends (it was formerly a line all of the way to the US border at Gretna) in Altona. The Southern Manitoba Railway which ran west from Morris for 80 miles was torn up in 2008, due to non-use. ^ a b "2016 Community Profiles". Statistics Canada. Government of Canada. Retrieved 2017-04-15. ^ National Archives, Archivia Net. "Post Offices and Postmasters". Retrieved 2014-08-04. ^ a b "Manitoba Heritage Council Commemorative Plaques". Retrieved 2014-08-05. ^ "Manitoba Flood Information". Retrieved 2014-08-05. ^ "Town of Morris website". Retrieved 2014-08-05. ^ "NHS Profile, Morris, T, Manitoba, 2011 (The sum of the ancestries in this table is greater than the total population estimate because a person may report more than one ancestry (ethnic origin) in the National Household Survey.)". 2011. Retrieved 2014-06-14. ^ "Manitoba Stampede and Exhibition". Retrieved 2014-08-05. ^ "CN network map (Search by station)". Retrieved 2014-08-05. Wikimedia Commons has media related to Morris, Manitoba.